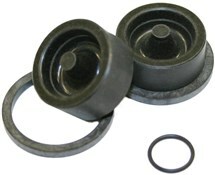 Replacement piston feet and seals for use with Avid Juicy brakes, 2005 and later models. My old Juicy 7 were a ready to be upgraded but first I thought to try to refurbish them to save some £. I am buying another set for the rear brakes as these just saved me considerable amount of money by servicing my old brakes.